This Product has Manufacturer's warranty. So please contact Manufacturer if any issue. Vacuum not included. Spacer color may vary.This product is for human being only. It's not suggested for pets. The Precision Home Haircutting System with the Flowbee Precision Haircutting System, give you professional hairstyling results in the convenience of your own home. In fact the system is so simple and precise, can give yourself a perfect cut even with your eyes closed! In the same fashion that hairdressers pull the hair up between their fingertips to give a layered scissors cut, the Flowbee uses the suction power of your household vacuum to draw the hair up to the desired length, and then gives it a perfect cut every time. Most popular hairstyles from 1/2" to 6" long can be cut with Flowbee. 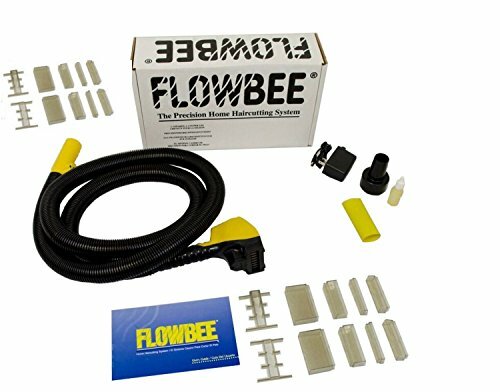 The Flowbee spacers make it IMPOSSIBLE to cut the hair shorter than the length for which they are set. For that perfect tapered cut around the ears and neck specially designed spacers are also supplied. !! Click Here Everyday Special Sale ! !